Where there’s sun, there’s BBQ. The coals of this warm-weather tradition are about to heat up, so it’s time to start planning a grill-worthy ensemble. Whether you’re whipping up portobello patties or a batch of burgers, here are four summer-ready looks for every barbecue. What are you waiting for? Cue the ‘cue! If you’re headed to an afternoon BBQ with friends or family, come prepared with your famous potato salad and an ensemble that can withstand the heat. 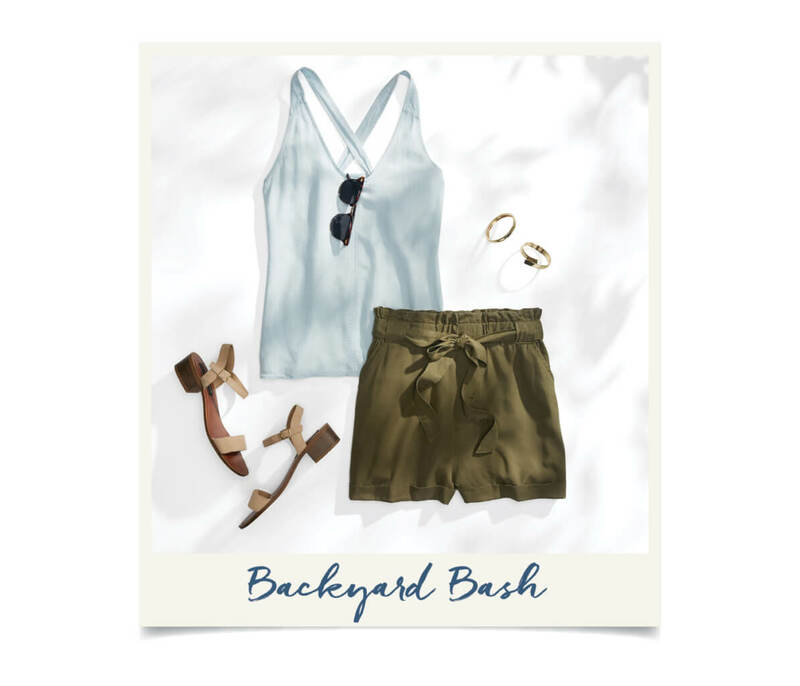 Pair a lightweight tank with universally-flattering tie-waist shorts. Opt for low, wood-block heels—you’ll probably be on your feet waiting for those hot-off-the-grill goodies. Stylist Tip: “Choose bold accessories for a neutral ensemble, or go simple if you don patterns or prints.” —Laurie H.
Once summer hits, it’s time to head to the ocean. 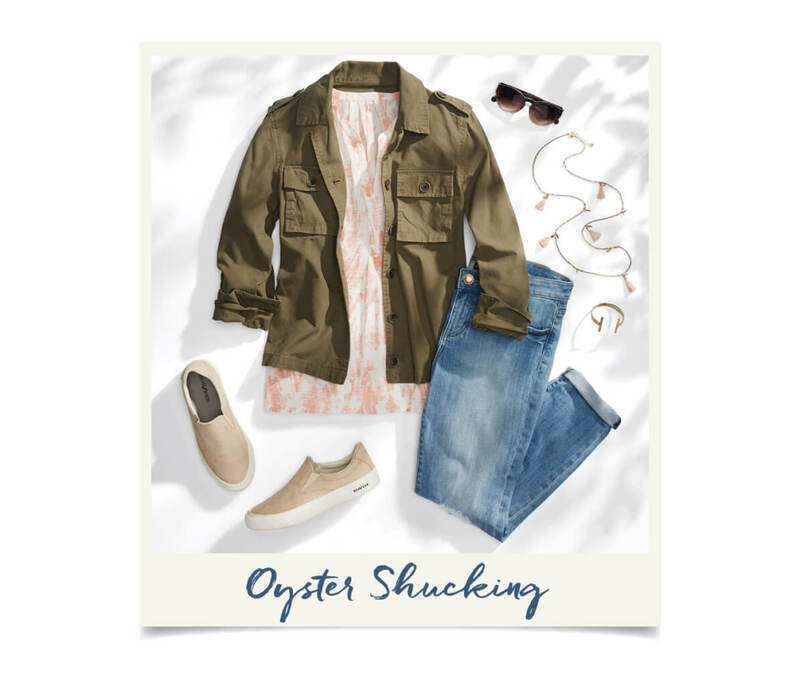 If a seaside day of shucking oysters is on your summer bucket list, get ready to layer up! A cargo jacket can play double duty—tie it around your waist in the sunshine and button it up at sunset. Slip-on sneakers will be a handy if you feel like dipping your toes into the water. 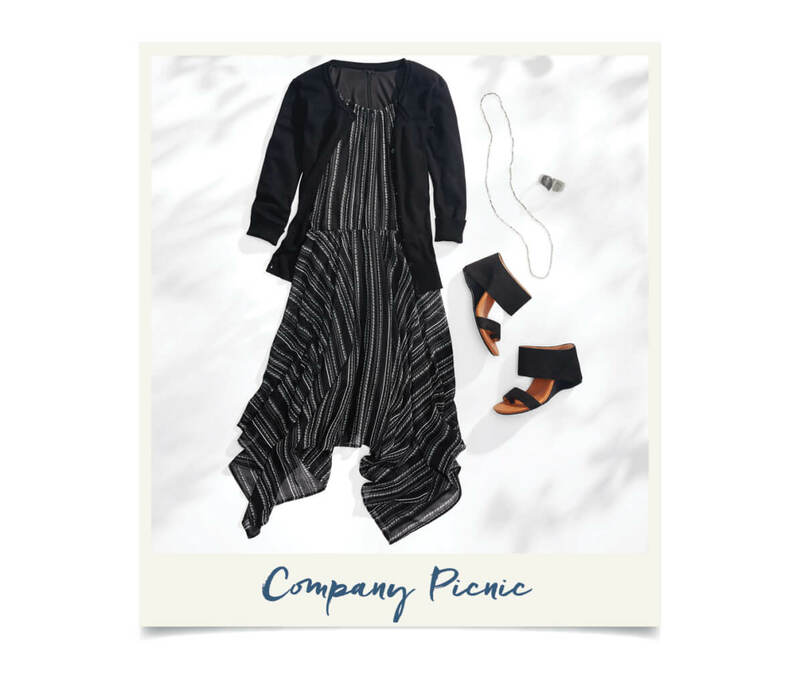 Stylist Tip: “Our pick for all-around comfort through the whole day is a great pair of light wash, cuffed jeans that keep you cool during the day, but cozy at night!” —Jodi I.
You’re already impressing your colleagues with your outfits from 9-to-5, so a company picnic is a walk in the park. The wispy fabric of a handkerchief dress make it an ideal length (not quite midi, not quite maxi), but totally BBQ appropriate. Slide into a pair of mule wedges and enjoy the office-appropriate pleasantry! 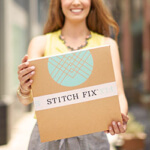 Stylist Tip: “When dressing for a company event, here’s a rule of thumb for sleeveless tops and dresses: Your strap should be at least three fingers wide and should always cover your bra strap.” —Michelle D.
Summer nights call for a shift dress—the perfect piece to bask in those warm breezes. A classic black and white pattern is perfect for an under-the-moon BBQ, just be careful with the mustard! Pointed-toe flats keep the sophistication going all night long, especially when they color coordinate with your dress. Stylist Tip: “Minimize trip hazards by wearing a pair of flats, especially when there’s minimal light and you’ll be mingling under the stars.” —Tyler S.
What stylish looks will you be wearing to your next BBQ? Tell us in the comments below!